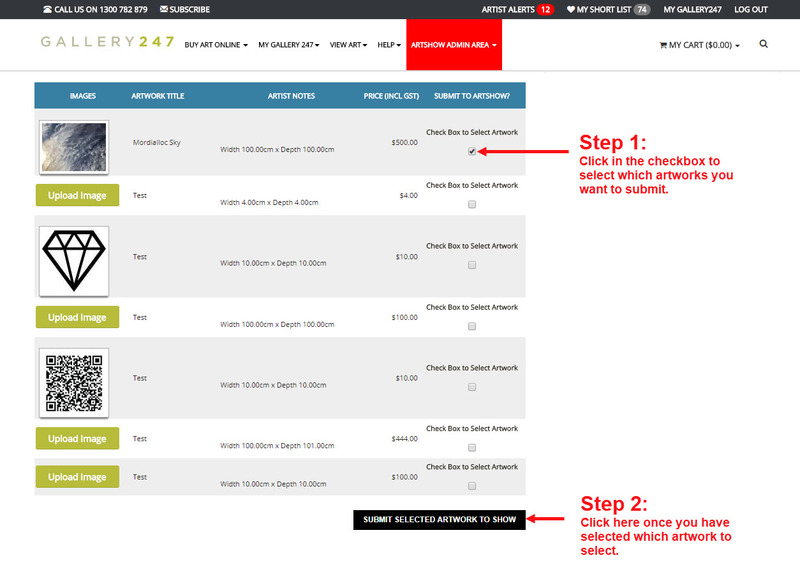 These instructions only apply to those art shows that use the Gallery 247 Art Show management platform. Register yourself as an artist and complete your artist declaration, just as if you are filling an entry form. This step automatically pre-registers you for all participating art shows. Create your personal gallery by uploading photographs of your work, and their descriptions. This step also promotes your work between art shows you might chose to enter. Select which particular show you want to enter, select which works you want to enter into that show, and click on the [SUBMIT ARTWORK] button. Note: until you complete this step, your work cannot be seen by the art show selection panel. The art show concerned is automatically notified, and their acceptance panel then assesses which of your entries they will accept for hanging. 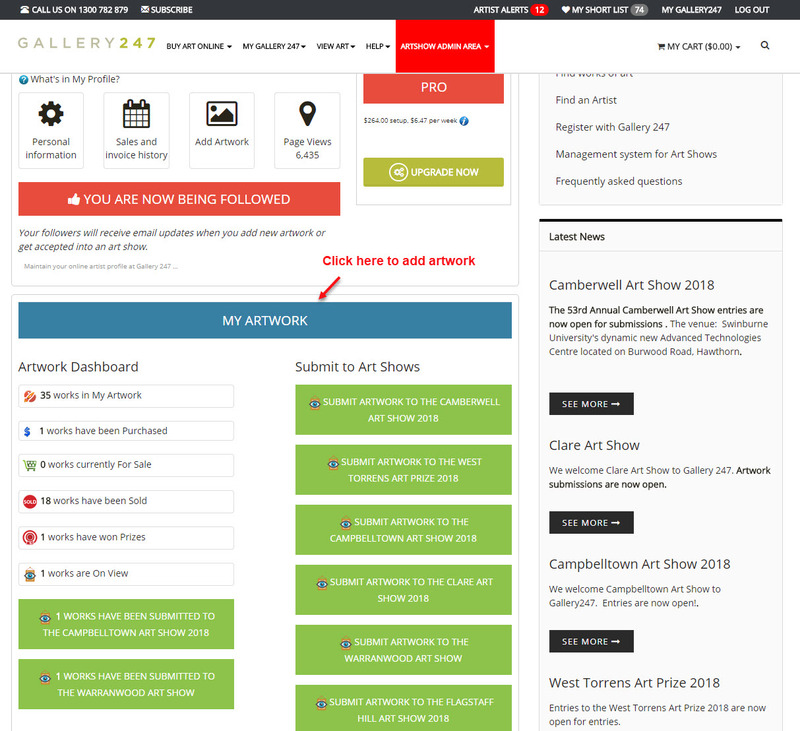 You will be automatically notified which of your entries have been accepted and you will be issued with an art show label with your allocated catalogue number. This will happen shortly after the show's closing date for acceptances. This stage only needs to be done once, and once completed, you are automatically pre-registered for ALL art shows using the Gallery 247 platform. To register as an artist, use our simple registration form. This is free, and after your details have been submitted, you automatically become member of Gallery 247, and you will be notified of your password by return email. Log in again to either the art show with which you’ve just registered, or log in to Gallery 247, using your email address as your user name and the password you’ve just been allocated. 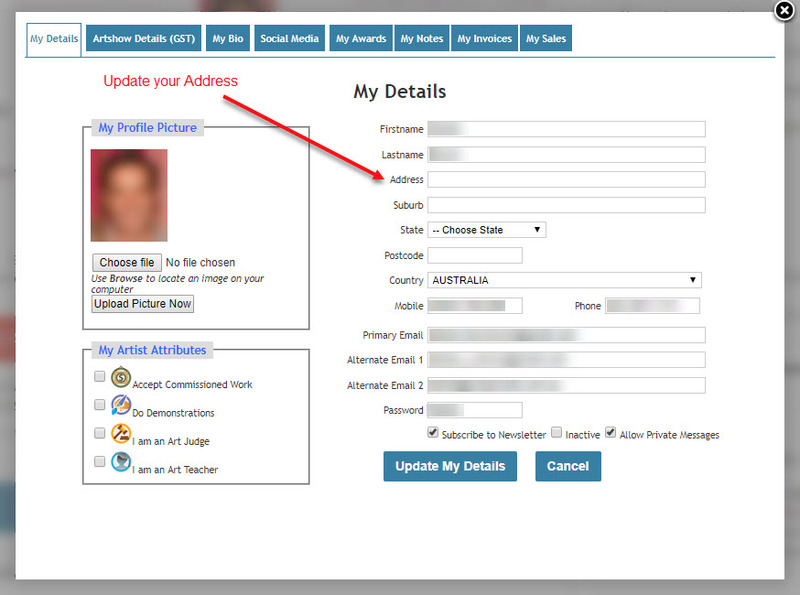 After you log in, it is important that you update your profile by clicking on the Update My Profile link. The My Details tab is to enter your contact information. You can also change your password to something you will easily remember. Your address is important because that’s where any cheque payment for sales will be mailed. 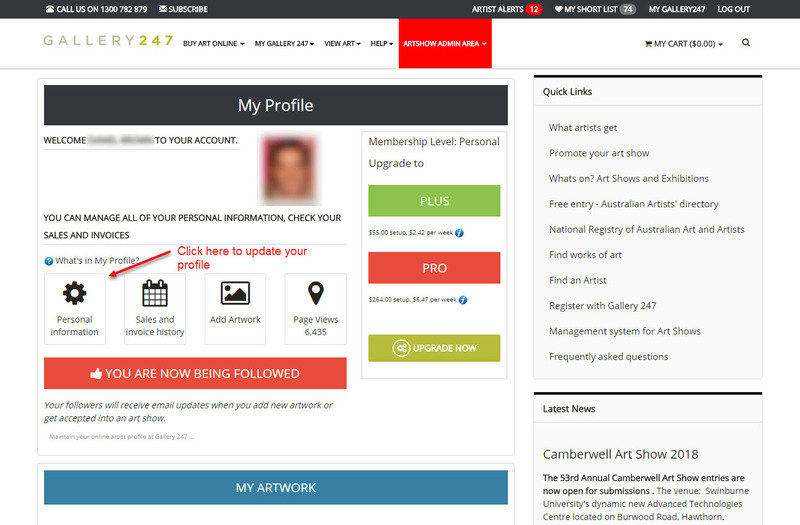 The Art Show Details tab is to do with your status as an artist. 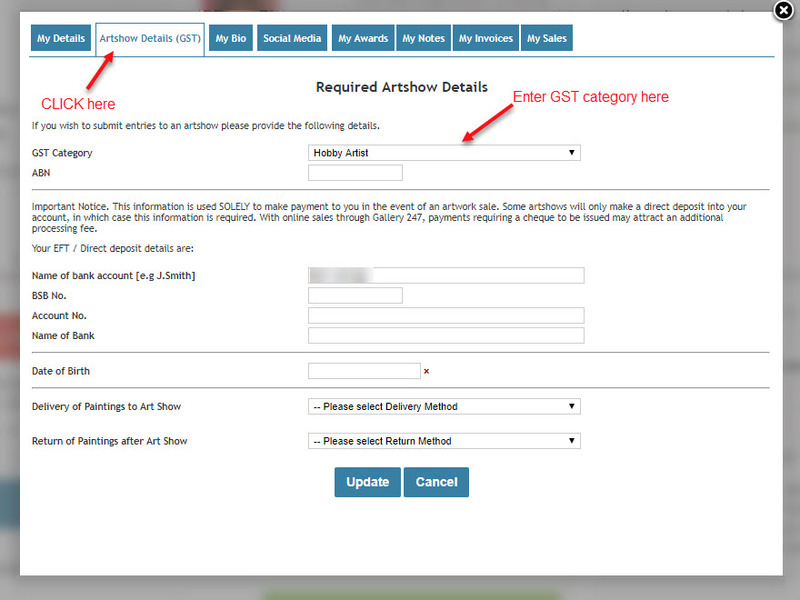 Your GST category is mandatory – if this is not entered you will be unable to submit any works to an art show. Your bank details will be used for the art show you’ve entered to make direct deposits into your bank account when works are sold. If the bank details information is left blank, you will only be able to receive payment by art show cheque. Note that many art shows won't issue cheques and will only make a direct deposit into this designated bank account. The My Bio tab allows you to enter your own biography / CV, which can be referred to by art show judges and potential purchasers of your work. Make sure that you click on [UPDATE] to save the information you’ve just entered. You only need to register once, irrespective of the number of art shows you plan to enter. This process consists of simply uploading one more photographs of each work. Where more than one image is uploaded, the system automatically generaes a slide show of that work. It's particularly useful in showing prominent detail or portion of the frame / mat. To access your personal gallery, after you've logged on click on the [MY ARTWORK] drop-down menu item under [MY GALLERY 247], or click on the Upload or Edit My Artwork link. 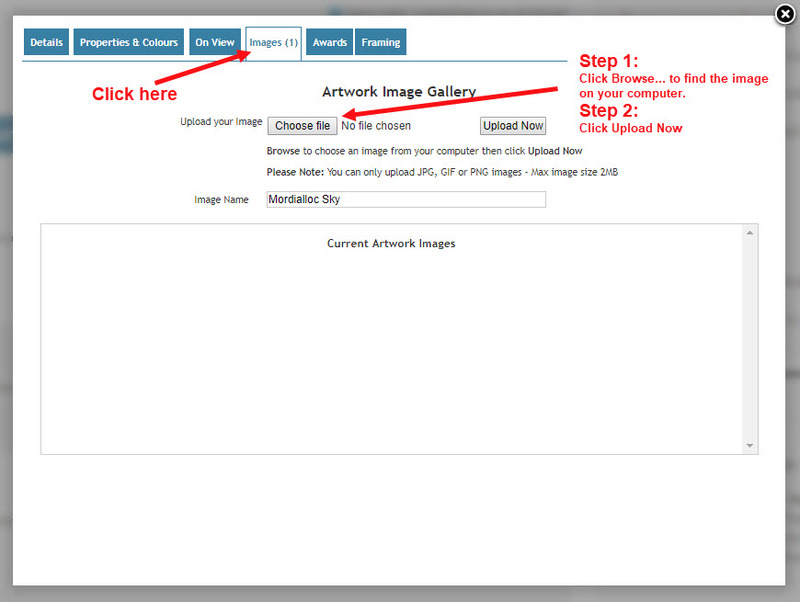 Add an artwork title, dimensions, medium, genre, base and artshow price, then click on insert artwork. You will then be asked if you wish to upload an image. Before you work on uploading images, you should refer to our tutorial on how to photograph your art work and after you photograph your painting guide. Once you have done this you can start uploading images related to that artwork. Just click on the item in your artwork list - then click on the Artwork Images Tab (across the top of the popup window), use the Browse button to select the image from your computer and then click on Upload. You can upload as many art works as you wish. This is your personal gallery, and whenever you decide to enter an art show, you select which works from your personal gallery as you want, up to the art show entry limit. After you’ve uploaded your photographs, you can select any work and edit its details, or upload additional photographs of that particular work. Note that whatever details you enter here are likely to be used in the art show catalogue, as well as the art show’s online preview gallery that’s open to the public. 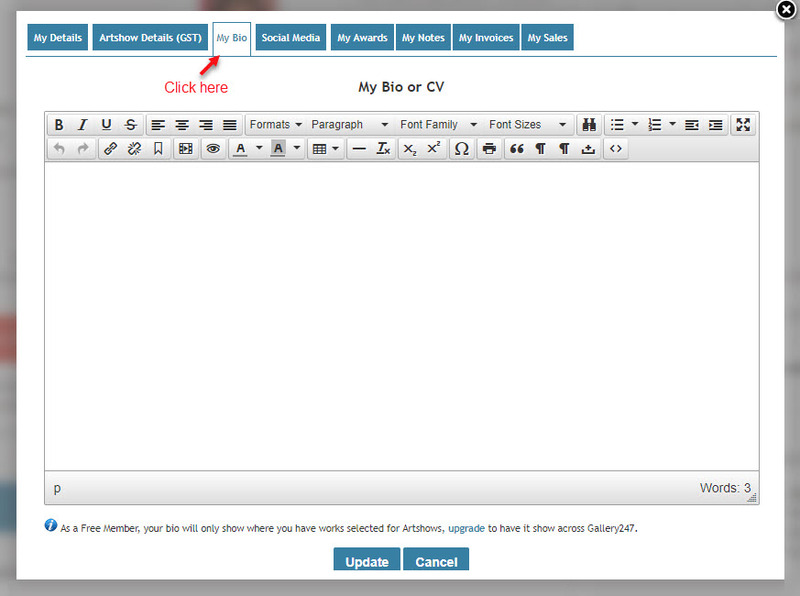 The Details tab allows you to change some details about the work itself. After any art show has accepted your entry, some details will no longer be able to be edited. The Properties tab allows you to write artist notes about the particular work, thereby adding a personal touch that is likely to interest potential buyers. The Subject matter is a brief description of the work itself; this information is used by potential buyers conducting online searches. The Keywords area allows you to enter additional search terms for the work in question, such as subject matter. The Artwork Images tab contains thumbnails of the actual image/s you’ve uploaded into your personal gallery. To enter any art show, click on the [SUBMIT TO ART SHOWS] drop-down menu item inder [MY GALLERY 247], or click on the Submit to artshows link in your MY GALLERY 247 page. Note that if you’ve logged in via a specific art show, that will be the only one you can enter. If you’ve logged in via Gallery 247 website, you will be able to select from any participating art show - all conditional on the show concerned accepting entries at that time. To submit one or more works, click on the checkbox next to the work or works you want to enter, and click on SUBMIT ARTWORK TO SHOW. Each show will have its own maximum number of submissions they will consider. So you will only be able to flag entries up to the maximum permitted by the show concerned. For those shows that require a fee for pre-acceptance submission, you will be presented with a secure payment form that provides for various methods of payment. On completion of the payment form you will be automatically emailed a tax invoice. Note: Until you complete this step, the art show selection panel cannot see your work to review it. Free gallery 247 membership allows you to store as many works in your personal gallery as you wish. Only 2 of these are visible to the public. The only time an art show sees your work is when you actually submit your work to a show. The only time that submitted works are visible on the Art Show's website is after they've been accepted for hanging or for display. Once the show is over, they remain visible as part of the show's history. If you decide to upgrade your membership, then more of your personal gallery becomes visible to the outside world, and is searchable within Gallery 247 as well as on Google and other search engines. The number of works you are allowed to display and sell on line depends on your membership level.